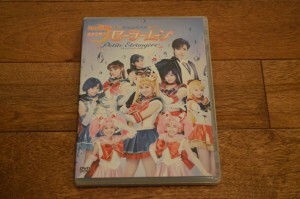 The Sailor Moon Un Nouveau Voyage musical was released on DVD in Japan on February 24th. 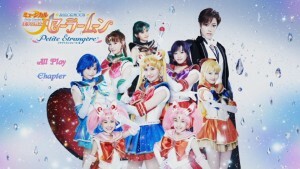 This is the third in the current set of musicals covering the Infinity arc of the manga which introduces us to Sailor Uranus, Neptune and Saturn as well as the Death Busters. 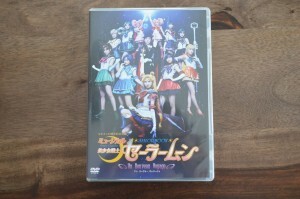 This is a Japanese only DVD which is region 2, so if you are looking to drop 6450 yen, about $57 US, on this to import it, realise you won’t be able to understand what anyone is saying unless you speak Japanese. This is a two disc set which includes the full musical on the first disc and some special features on disc 2. I bought my copy from Amazon Japan, though you can also get it from other retailers such as CD Japan. 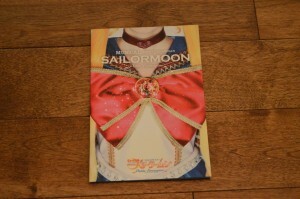 The packaging is quite nice, with the cover featuring the musical’s poster. 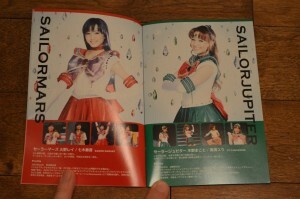 A special booklet is included which includes character descriptions and lyrics to all of the musical’s songs. The first disc, as I mentioned, is the musical itself. The run time is 2 hours and 36 minutes. It’s quite a long musical but this also includes some extra performances after the curtain goes down and some words of thanks from the cast, due to this being a recording of the final performance of the musical. Lots of crying! 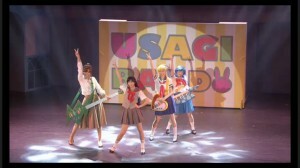 I realise I never actually did a full proper review of this musical when first played in Japan and became available to watch via fansub. I started writing one but put it off and at this point it’s so overdue it would be silly to release it. So much to say the musical is fantastic. It is faithful to the manga but still does its own thing enough to make it interesting. The new characters are great, as Haruka and Michiru have a great romance and Hotaru struggles with her illness in a very emotionally impactful way. The musical is great. The quality of this DVD is not so awesome. As with La Reconquista and Petite Étrangère, the DVDs are standard definition with interlacing, 480i resolution. This is typical of older TV shows shot on video but for a musical which took place in 2015 it’s a bit disappointing. There is no Blu-Ray because there is no HD version that has been recorded. It seems like the best resolution possible is what is on this DVD. The second disk has a lot of special features on it, of varying interest. As I’ve mentioned many times I don’t speak Japanese so a lot of these features don’t do me much good. 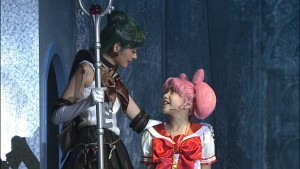 The first featurette focuses on the two actresses who are playing Chibiusa, Kokoro Kuge and Airi Kanda. They show up out of costume for a quick introduction and then we watch half an hour of parts of the musical they are in. We seem to go through all of their scenes from the musical. I’m not really sure what the point of this is but here we are. This whole thing is about 32 minutes. 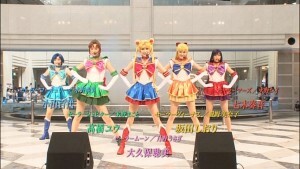 Next is an interview with the main group of actresses, that being the girls playing Sailor Moon, Satomi Ookubo, Sailor Mercury, Momo Koyama, Sailor Mars, Kanon Nanaki, Sailor Jupiter, Yu Takahashi, Sailor Venus, Shiori Sakata, and Tuxedo Mask, Yūga Yamato. They chat for about 45 minutes about various things. I really couldn’t give you any insight into the content of their conversations but they are extensive! Boy some of these girls have really short hair when not wearing those wigs. 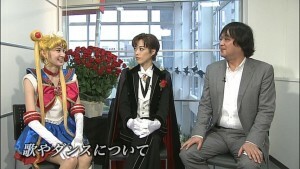 Following this is a similar interview with the Sailor Guardians from the outer solar system, that being Sailor Uranus, Shuu Shiotsuki, Sailor Neptune, Sayaka Fujioka, Sailor Pluto, Mikako Ishii, and Sailor Saturn, Karin Takahashi. 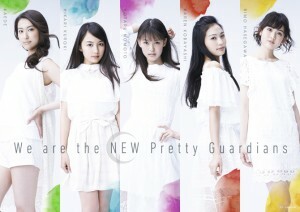 Again I don’t know what they’re saying, but one thing that caught my attention was how much Shuu Shiotsuki looks like Haruka. 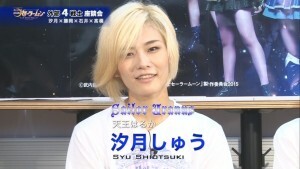 In the musicals all of the actresses wear wigs but her short blonde hair was quite like she looks as Haruka. This interview is about 18 minutes. To wrap things up we go back to the stage. 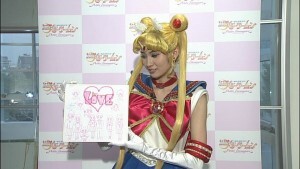 A sort of tribute clip is shown to the departing actresses who are playing Sailor Moon, Mercury, Mars, Jupiter and Venus. 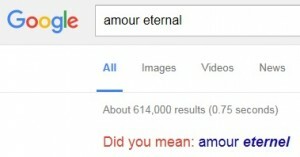 This makes them cry. Someone comes out to give them a piece of paper and more crying. They do a final number while crying. This is the crying feature. 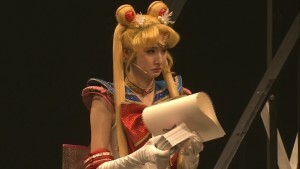 I may not speak Japanese but all people of this earth share a common language of crying! Included with this disk is a 26 page booklet which includes characters bios and lyrics for all songs from this musical. I’ve included photos of all pages from this booklet at the end of this post. You are surely wondering if this DVD is worth it! If you’re looking to watch this musical with English subtitles, you’d be better off getting the fan subbed version from Miss Dream. Of course this is technically piracy and does not support the musicals. Short of going to Japan to watch a musical yourself, something many fans have done, your best legal option to support this musical would be to buy this home video release. 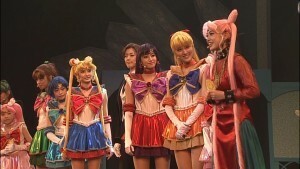 Keep in mind this is region 2, so you will need a region free DVD player to watch this if you don’t live in Japan. It is NTSC which will present other difficulties for those living in regions with PAL video standards. 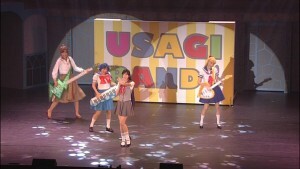 Despite the quality issues musical fans will probably appreciate having this. There are some nice features on here which fans may find interesting which have not been subtitled by anyone so this is the only way to get those. Naturally if you’re not fluent in Japanese you won’t get quite as much out of this. 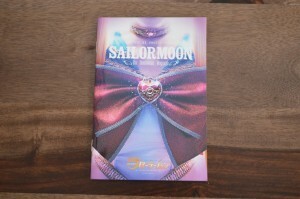 Keep reading to see more images of the menus, packaging and photos of every page of the booklet.